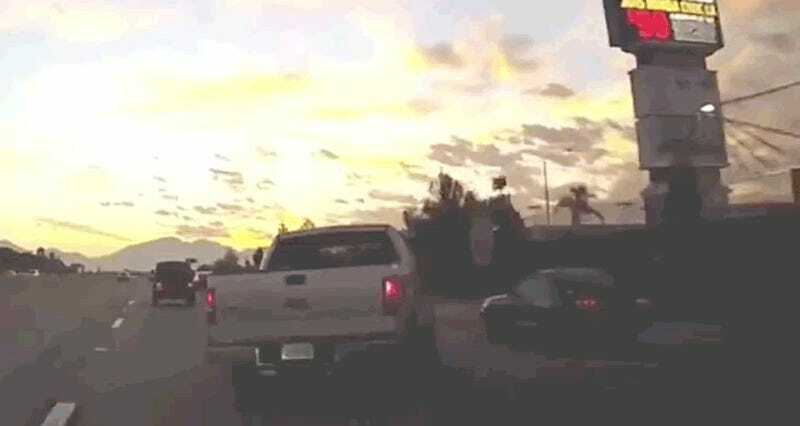 Yesterday morning, a driver in Fontana captured an insane accident on his dashcam as an out of control truck struck another car, sending the car into a spin and the truck flying over an embankment, landing in a car dealership lot. The driver who got the video thinks it may be a road rage-related incident. Yikes. The driver of the recording car says he heard honking right before the incident. It’s possible the situation started as both drivers attempted to merge into the same lane at the same time, but it’s not clear. What is clear is that an F-150 can spin a Mustang like a top just before taking off in an impressive bit of flying most trucks don’t get to demonstrate. Luckily, no one was killed, though the truck driver was hospitalized for, and I’m guessing here, landing in a parking lot in a flying truck-related complications. The truck eventually landed in a Rock Honda dealership lot, damaging 11 cars. If it was only a VW dealership, and he hit the lot with the TDIs, I bet the truck driver could have made some money out of the whole thing. It’s confusing as to what actually happened here — was the truck trying to do some sort of deliberate PIT maneuver, or was the driver already out of control? What happened right before this? Was this road rage, or just wild overcorrections/too much speed?